Getting top dollar when selling your home is the ultimate goal. Envisioning how you would style a space is one thing, but actually showing buyers a room’s potential is the ultimate goal. Sometimes prospective buyers need a little extra push to make an offer. The simplest thing you can do to boost buying interest is to properly stage your home for showing. In this post, we’ll focus on the bedroom as we highlight some tips and tricks you can easily implement to give your home that added ‘wow’ factor so you can sell your home faster. Professional stager, Nancy Hull of Signature Staging says, “To prepare a house for sale, look at each room and think – less is more. I recommend determining what is necessary in each room – say a bedroom for example, bed makes sense, perhaps a dresser, maybe even a TV, but things like laundry, hair products, wires from a TV, etc. should all be hidden and put away”. Decluttering is one of the biggest challenges for sellers, but it is a MUST. Be cautious with this one though. Less doesn’t mean sparse. You need enough in the room to give it style, but not so much that it’s overwhelming. A healthy balance of furnished without clutter is what you’re aiming for here. Whether you have a green thumb or not, fresh flowers are a quick and easy way to brighten up a space. They look great in pictures and are always aesthetically pleasing. The key here is to keep them up and fresh for showings – droopy or decaying plant life is a total turn off. It is recommended to take half of your clothes out of your closet and store them elsewhere. If you’re running low on storage space, hiding clothes under your bed is an acceptable solution (seriously, it’s what the experts do). If you leave your full stock of clothes, shoes, and accessories in your closet, it may send a message to buyers that you’re moving because your house is too small. Whether that’s true or not, you don’t ever want to ever off that impression. 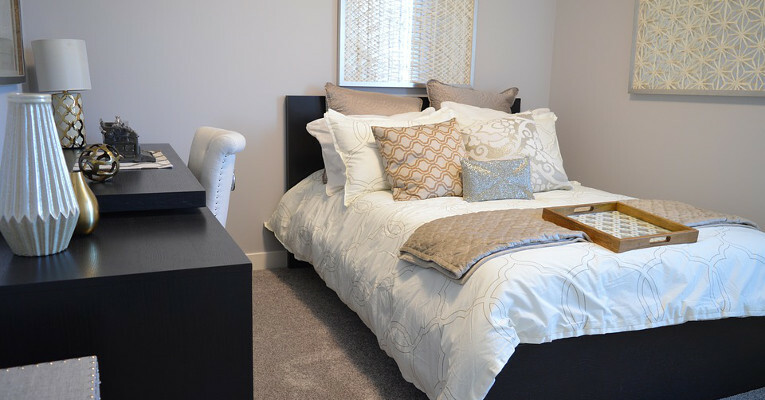 Staging your bedroom should help you sell your home and make money. You don’t want to spend a large chunk of your profits on décor like a fancy headboard or a plush mattress. In fact, Jennifer Carroll from the blog Celebrating Everyday Life stages her homes with air mattresses! The ultimate must do when using an air mattress, Jennifer cautions, is to elevate it off the floor so buyers don’t know it’s an air mattress. Jennifer likes to use empty storage tubs to do this. For a queen size mattress, she uses a total of six tubs (three on each side of the bed). Jazzing up your bed with a headboard is a nice touch, but let’s face it, headboards are often pretty pricy. So, why not fake one? A large piece of artwork does a great job of masking the fact that there isn’t an actual headboard in the room. As long as there’s something in the space where a headboard would typically be, buyers won’t think twice about it. At the end of the day, a bedroom is the place you retreat to for some much-needed relaxation. You don’t want that relaxation to be disturbed by bright and blinding colors. Keep it cool, soothing and serene with a normal color palate. You want it to feel almost spa-like. Blue is favoured as a calming bedroom color choice. It’s also wise to keep your bed linens neutral. Minimize negative distractions caused by busy patterns or bold throw pillows. Just because you own a King size bed doesn’t mean you should automatically use it when staging your home. A study conducted by Rave Home Staging & Training found that the average buyer typically feels that beds are significantly larger than they actually are. In turn, not having a bed in the room could actually cause the room to appear smaller, and typically leaves the buyer wondering how the heck their own furniture is going to fit in there. It is definitely wise to include a bed in a bedroom, but you don’t need to worry about going too large. Give the room a more grandeur feel by swapping your King size bed out for a Twin. And for some really great tips in this area, check out these different types of beds on The Sleep Judge. Put the focus on the bedroom itself and not on who is currently living in it. Michelle Minch, owner of Moving Mountains Design says, “homeowners should remove any photographs or artwork that has a face with eyes because buyers often focus on the people in the image more than the features of the home”. If you want to include photos, try something more abstract or perhaps a nature shot. This tip goes hand in hand with the “no family photos” suggestion. Michelle explains, “You don’t want somebody to come in and look at your house, and look at a picture of you, and say, ‘My family isn’t like that,’ or, ‘They are different from me, so this house isn’t for me’.” This can be avoided by simply tucking your religious artefacts away in a drawer during showings. Mirrors are a great way to reflect light and open up a space. Consider propping up a full-body mirror against a wall or adding a mirror above your dresser. Giving your bedroom a light and bright feel makes it appear more welcoming. Curtains are a simple but necessary bedroom staple. Choose curtains that match the style and color of your room; adding to the calming effect rather than retracting from it. If you’re overwhelmed by the many styles and colors of curtains out there, then remember this tip: You can never go wrong with a basic sheer curtain panel. Opened blinds and pulled back curtains are ideal for a home stage. This should go without saying, but make sure your bedroom is thoroughly cleaned before any showing. There should be no remnants of dust, dirt, or grime. The floor should be swept, the bed should be made, and the window and mirrors should be streak free. Lastly, all light bulbs should be intact and fully functional. A properly staged bedroom is inviting, comfortable, and elicits that desired feeling from buyers. Apparently, homes that are staged well sell twice as fast than unstaged homes. So, the decision to stage your bedroom before inviting buyers to tour it should be a no brainer, right? “You never get a second chance to make a first impression” is the favourite saying among real estate agents and stagers, and for good reason. If you stage your bedroom before listing it, it will save you both time and money in the long run. Get the biggest bang for your buck with these simple tips and tricks. Need a really fast sale? While these easy home improvement tips can add value to your property and result in a faster sale, time is often not on your side. If you need a really fast sale then you may want to consider a cash property buyer. We partner with a select group of cash buyers who purchase 100s of UK homes every year and can help you complete a sale in as little as 7 days! We buy any house in any condition. For a FREE valuation contact us.